The second album from Copper, the project of local singer/songwriter Peter Obermark that features a supporting cast of accomplished Cincinnati musicians, is set for release Thursday. The Devil You Know will be fêted with a free release show Thursday at The Redmoor (3187 Linwood Ave., Mount Lookout, theredmoor.com). Copper (Obermark plus many of the guest musicians from the new album) performs at 8 p.m., followed by Flying Underground, the band led by acclaimed songwriter/guitarist Brian Lovely. Obermark’s dedication to the power of a strong melody is evident across all 10 tracks on The Devil You Know, putting him in Cincinnati’s enduring lineage of smart, clever and potent Pop Rock that is led by veteran songwriters like Rob Fetters, Bob Nyswonger and Chris Arduser of The Raisins/psychodots family (Arduser co-produced Copper’s new album and is one of the main instrumentalists on the release, while Nyswonger provides bass on a pair of tracks), Roger Klug, Lovely (who lends guitar to album closer “The Revulsion Will Not Be Televised”) and others. Over the past three-decades-plus, many songwriters have shown the influence those great craftspeople have had on their writing, and with his Copper releases, Obermark proves himself be one of the more gifted disciples. Highlights from Copper’s latest include the effervescent title track and its rock-solid, harmony-laden chorus hook, the dynamic “Radio Free Jesus,” with its engaging tonal shifts between gloom and radiance, and the fuzzy, frisky romp “Death and Texas,” one of two cuts to feature the resplendent vocals of Cincinnati singer Krystal Peterson. 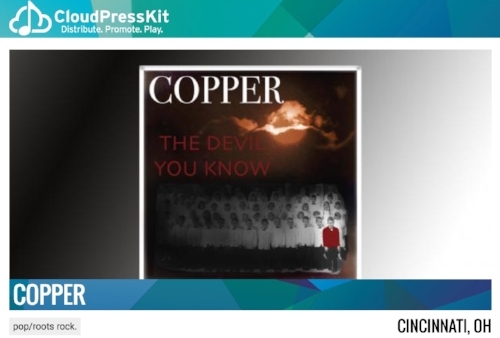 Cincinnati legends Chris Arduser, Bob Nyswonger, Brian Lovely, George Cunningham, Charlie Fletcher, Don Aren and others take the stage with Peter Obermark to release Copper's new album, The Devil You Know at The Redmoor on November 3rd. Obermark, songwriter, guitarist and founder of Copper, is a keen cultural observer. He spotlights social turbulence in songs like "The Revulsion Will Not Be Televised"--his rousing anthem about the dumbing-down of American politics--and "Radio Free Jesus," a biting look at the hubris of the western world. He serves his message with a twist. "I write songs about love, longing, death and the best of intentions gone horribly wrong," says Obermark. "Yet, I set most of my lyrics to upbeat, guitar-driven melodies. I want the music to be fun to listen to, even before you know what the songs are about." The Devil You Know mixes politics with love, featuring odes to Obermark's wife and son punctuated by songs like "Socialism for the Baileys," the anti-war "Blue Eighty-Eight," and his elegy for the middle class, "Death and Texas." The Devil You Know is produced by Matt Hueneman of Cattle Dog Productions and multi-instrumentalist Chris Arduser. Hueneman and Arduser will join Obermark and Bob Nyswonger, Brian Lovely, George Cunningham, Kelly McCracken, Krystal Peterson, Don Aren, Charlie Fletcher and Hallie Menkaus for the album release show, performing songs from The Devil You Know and Copper's 2014 debut album, Fade to White. Copper's show starts at 8 pm Thursday at The Redmoor. Cincinnati rock band Flying Underground performs after Copper at 9:15. Doors open at 7 pm and admission is free.